A Q&A with two leading pain management experts provides insight into opioid use and abuse in the U.S. compared to Europe. In 2017, the U.S. Department of Health and Human Services declared the opioid crisis a public health emergency. But the problem began brewing long before last year, with the age-adjusted rate of drug overdose deaths increasing more than three times between 1999 (6.1 per 100,000) and 2016 (19.8 per 100,000), according to the Centers for Disease Control and Prevention. A conversation with two leading pain management experts, Richard Rosenquist, MD, and Jan Van Zundert, MD, PhD, provides insight into opioid use and abuse in the U.S. compared to Europe. 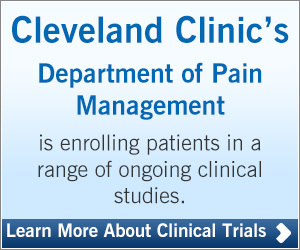 Dr. Rosenquist is Chairman of the Cleveland Clinic Department of Pain Management. Dr. Van Zundert is an anesthesiologist who heads the Multidisciplinary Pain Center at Ziekenhuis Oost-Limburg in Genk, Belgium. Q: Given the current opioid epidemic in the United States, are pain management patients today more receptive to other treatments? Dr. Rosenquist: It’s a mixed bag. We have people who hear the message and are worried, some of whom have been taking opioids for a while. Even some people that are taking them legitimately are beginning to have questions. But there are others who are so physically or psychologically dependent on opioids that a cataclysmic event could come along and they would not change their minds: They can’t or don’t want to imagine life without opioids. This has been the ongoing battle. Physicians who bought into opioids for chronic pain started people on the medications and were told to just give them more and more if the meds didn’t work and eventually the patients would get pain relief. Well, that didn’t work. Long-term use of opioids is only partially effective in most cases and is associated with many adverse long-term effects on the body. Q: Has the same message about upping the dosage to provide pain relief been prevalent in Europe, too? Dr. Van Zundert: In the last 20 or 30 years in Europe there has been an increase in the treatment of pain just as in the U.S. But opioid treatment is rather limited. We’ve known since the last decade that opioids don’t have the desired effect, and most people stopped using them due to side effects or non-effectiveness. That seems to be a bit different than in the United States where opioid usage was increasing. If the opioids didn’t work, the dosage was increased. Q: So what other pain treatments can be used instead of opioids? Dr. Rosenquist: If you look at the things that are good for chronic pain they are the same things that are generally good for your health: eat a healthy diet, don’t smoke, exercise regularly, maintain a healthy weight, and get a decent night’s rest – all those things help with chronic pain. You can also do things such as mindfulness-based stress reduction, acupuncture, physical therapy and injections, which may help to provide some period of relief or reduced pain. But unless you combine those things with the pillars of general health, you don’t get better in the long run. Dr. Van Zundert: In chronic non-cancer pain we try to avoid opioids and prefer minimally invasive percutaneous interventional pain management, such as epidural steroids for sub-acute radicular pain and radiofrequency and pulsed radiofrequency treatment for a lot of other conditions. We also recommend pain rehabilitation programs that include coping, acceptance and commitment to reduce the pain as much as possible. The programs stress the importance of a realistic approach and goals. I think in Europe we are a bit more careful watching our patients and not thinking we always have to reach the goal of zero pain. I hear from my American colleagues that the ‘careful watching’ approach is very difficult to explain to American patients. Q: What are we doing at Cleveland Clinic to foster conservative management of pain patients and help eliminate the opioid epidemic? Dr. Rosenquist: There are a lot of non-opioid based approaches from an interventional standpoint that we are incorporating into larger, multidisciplinary programs. For example, we have a novel program for treating people with chronic back pain who have not had surgery called Back on TREK that is psychology and physical therapy-based with physician oversight. We also have a long-standing Chronic Pain Rehabilitation Program that consists of a three-week outpatient, multidisciplinary program. In addition, we are providing education to surgical staff, physician assistants, nurses and other healthcare providers all across the system. We are trying to get surgical teams to change expectations: Prescribe the appropriate amount of pain medication after surgery, and tell patients they will get five or six days of opioid medication after select surgical procedures followed by a transition to non-opioid based analgesics and that pain or discomfort is common as part of the healing process and not the end of the world. Creating that attitude on a national basis is something we all have to do. There is no magic bullet for complete pain relief. Q: Why do you think European countries have less of a problem with opioid addiction and are more accepting of conservative approaches to pain management? Dr. Van Zundert: I think perhaps it’s because healthcare is much more regulated in Europe. There are regulatory agencies at the European Union level, as well as national healthcare organizations within each country. Hospitals, general practitioners and pharmacies must follow certain rules and regulations. Take referrals, for instance: Pain patients cannot go directly to a pain center. They must first see a general practitioner or a second line specialist. Also, regulations forbid advertising by pain centers and pharmaceutical companies in Belgium and other European countries. Q: What can the U.S. healthcare community learn from Europe’s approach to pain management and addiction? Dr. Van Zundert: The main message is stop prescribing opioids for chronic pain and practice more evidence-based medicine. Of course, that’s not the cure-all solution. But after 20 years, we see there is no evidence of the effectiveness of opioids on a widespread, long-term basis. A combination of more regulations in healthcare, more emphasis on evidence-based medicine guidelines and a commitment to treating patients only with what they need will prevent a lot of problems. We are all stakeholders in this same issue, and we have to turn this around from a negative story to a positive story. Q: What can pain management physicians do to change the narrative on opioid abuse? Dr. Rosenquist: We have to do everything we can to help patients understand that we’re interested in their health and trying to give them the best possible care. We want to work with patients as part of the team – get them engaged in the overall process. We don’t have a crystal ball that we can look into and figure out what’s wrong and how to fix it. I enjoy working with patients to find non-opioid alternatives and promote overall good health and function. And it’s rewarding when you see people succeed. I’ve had many more people thank me for getting them off opioids than I have for putting them on medications.